Lukas Nursery is now offering FREE ADMISSION to the Butterfly Encounter through the entire summer 2009!! This is a wonderful adventure for you and your family! Your kids will love the wild butterfly greenhouses where they can see the butterfly nursery, and learn all about the butterfly lifecycle. We saw caterpillars munching and napping, and a variety of butterflies dancing around the fragrant butterfly flowers within the butterfly greenhouses. There was 2 flowing fountains, a mini footbridge, and a education station. Guided tours are available with groups upon request. The gift shop was amazing , and filled with things you won't find anywhere else! I suggest you add to your fun filled adventure by buying a caterpillar and grow kit, and take it home and watch it go through it's stages to become a beautiful butterfly. Then you can release it into the wild to start a new generation! Bryan loves butterflies, especially the colorful caterpillars! We bought a Gold Rim Swallowtail Caterpillar, and a Painted Lady Caterpillar, along with food and instructions. We monitor our new pets every day, and are anxiously waiting the next stages! This is an excellent hands-on educational experience for your child! 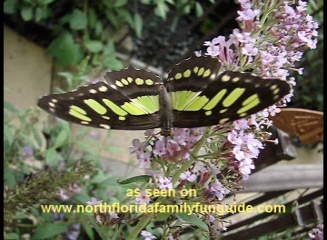 Come take advantage of the FREE admission, and help them continue this wonderful Butterfly Encounter for years to come, by buying a wonderful gift in their Butterfly themed gift shop!